Trying to lose weight is always near the top of our New Years Resolution list. While boot camps and high-intensity, interval training are all the rage, they can cause injuries and are hard to sustain for long periods of time. They are great for short-term changes in your body. But if you are truly seeking a sustainable healthy lifestyle change you must learn how to optimize your workouts. Otherwise, you will not reap the full benefits of the hard work you are putting in. It is better to start before the holidays and keep going in 2019. It is all about a lifestyle change. The team at RaveReviews.com created 6 Steps to an Optimal Workout. Pre-Workout Supplement: This gives you the energy you need for your mind and body to maximize the workout. 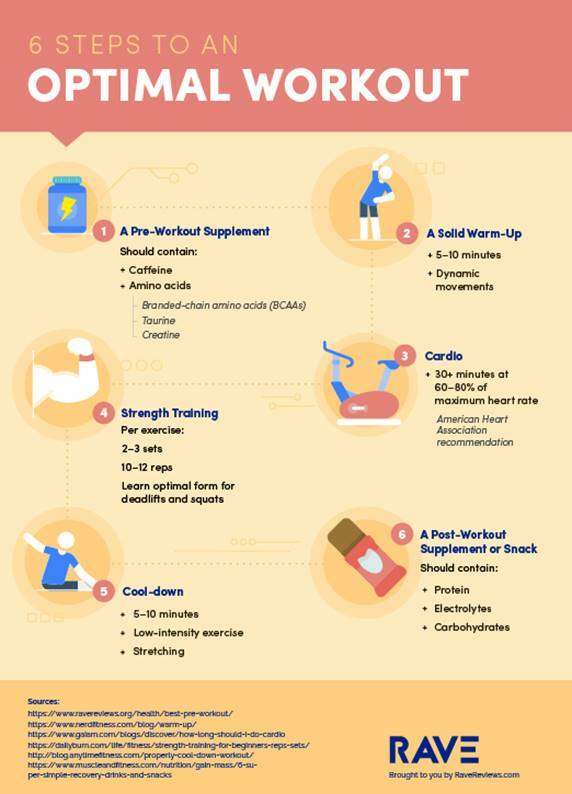 There are countless supplement options but it is critical to use on containing caffeine, amino acids, taurine and creatine. Solid Warm Up: Especially for younger people who think they are invincible, nobody beats father time. It is critical to spend 5-10 minutes warming up with dynamic movements to prepare your muscles for the stress they’re about to endure. Cardio: Spend at least 30 minutes on cardio for weight loss. The American Heart Association recommends that during cardio your heart rate should be between 60% and 80% to maximize effectiveness. Most cardio machines will show you your heart rate so you know whether or not you need to kick it up or down a notch. Strength Training: Most gyms offer one free training session. Take advantage of this to learn which machines or free weights to use. For each body part, you will want to do 3 sets of 10 reps each. It is critical to learn proper form, especially for deadlifts and squats, or you will injure yourself. Cool Down: I know you want to get home to watch the Bachelor, but spend 5-10 minutes doing a low intensity exercise and stretching. This is also one of the most overlooked reasons injuries occur. Post Workout Supplement or Snack: Do you like collecting interest from your bank? Having a post workout supplement or snack will exponentially increase the results of what you have just accomplished. Choose one with protein, electrolytes and carbohydrates.